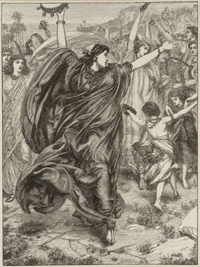 According to the Book of Exodus in the Old Testament, Miriam, the older sister of Moses and Aaron, played a crucial role in the Israelites’ exodus from Egypt. It was Miriam who, at her mother Jochebed’s request, hid the baby Moses by the side of a river to save him from the Pharaoh’s order for the execution of newborn Hebrew boys. She watched as the Pharaoh’s daughter discovered the infant and adopted him, and arranged for Jochebed to become Moses’ nurse. Like her brother, Miriam was considered a prophet and a leader. She is a popular figure among Jewish feminists; some place a “Cup of Miriam” (filled with water) beside the customary “Cup of Elijah” (filled with wine) during the Passover Seder.